Despite being a dietitian and knowing the importance of drinking enough fluids each day, I often struggle to get enough fluids into my day. For some of my favourite strategies on how to drink more fluids if you are not a water lover check out this previous article I wrote here. One of the ways my hydration has improved is by switching to sparkling water in the evenings when I get home from work. 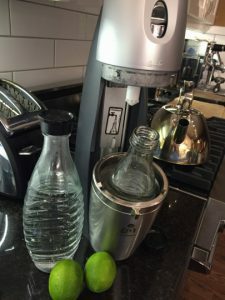 Our Soda Stream Sparkling Water Maker is one of the most frequently used kitchen gadgets in our home. Both my husband, son and I all enjoy the fizz of sparkling water either plain or with a splash of fresh lemon or lime. Do you have a favourite way to infuse flavour into sparkling water? Post your thoughts on our blog below. I buy a bag of lemons and limes, slice them, and freeze. When I pour my sparkling water from my Soda Stream, I add a few slices for a colorful, flavorful cold water! that sounds delicious and fresh!